Getting your research published: Simon Harris, IOP Publishing; LaTEX: Dr Paul Stevenson, University of Surrey; MATLAB: Prof Peter McDonald, University of Surrey; Python: Dr Timothy Kinnear, University of Kent and Organising meetings and conferences: Kay Pearson, Employer Engagement Officer, University of Surrey. Professor Peter McDonald, GRADnet Director, gave an introduction to GRADnet and details of the free training opportunities available in this academic year. 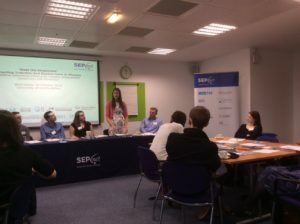 This was an excellent opportunity for first year postgraduates to network with their SEPnet partners. One student reported that the speakers were “brilliant” and the event was “top notch”. 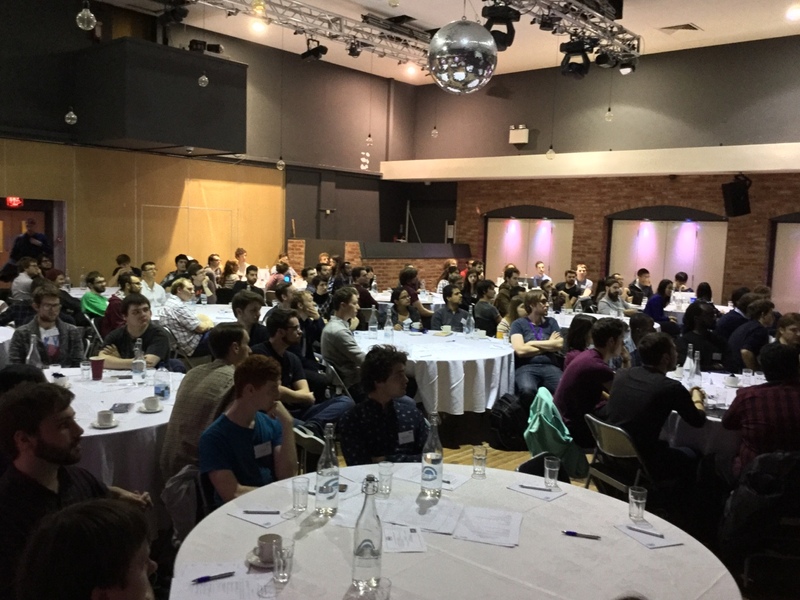 Cristobel Soares-Smith, GRADnet Administrator, said “this was one of the best attended events by physics postgraduates and I hope to see many of the attendees at future GRADnet residential schools and one-day workshops”. Connecting Industry and Researchers in Physics – SEPnet’s physics PhDs and employers came together for a lively networking evening at University of Hertfordshire on 19 October. Key employers AWE, Culham Centre for Fusion Energy, GlaxoSmithKline, Leonardo, Royal Marsden, Ultra Electronics and others met physics postgraduates and postdocs to talk about what they can offer industry. Students also met data science experts, Pivigo, and Oscar winners, Framestore, in a structured networking session which raised their awareness of how their research can be applied in a wide range of industries. 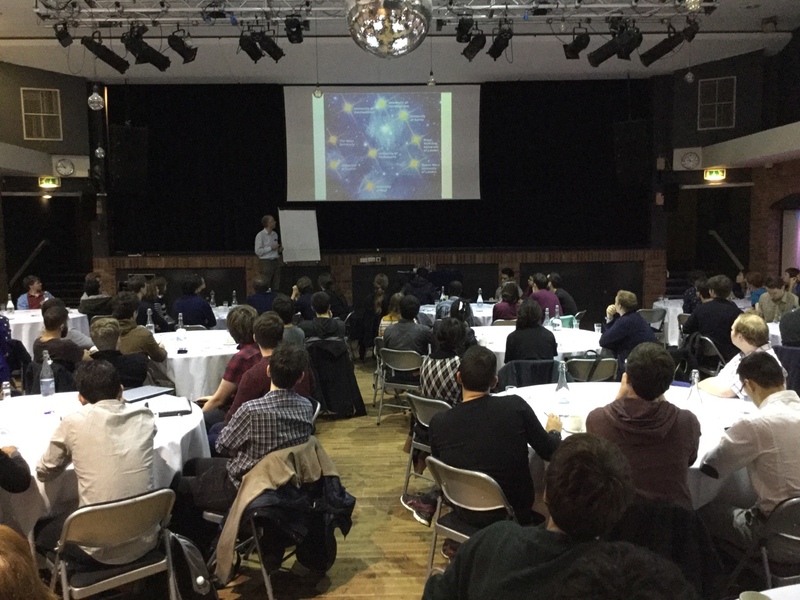 Asked what students gained from the evening, comments included: ‘that my very narrow field links to the wider world’, ‘how my astrophysics research translates into useful transferable skills for industry application’, ‘I met some really interesting (and hopefully useful) people’. 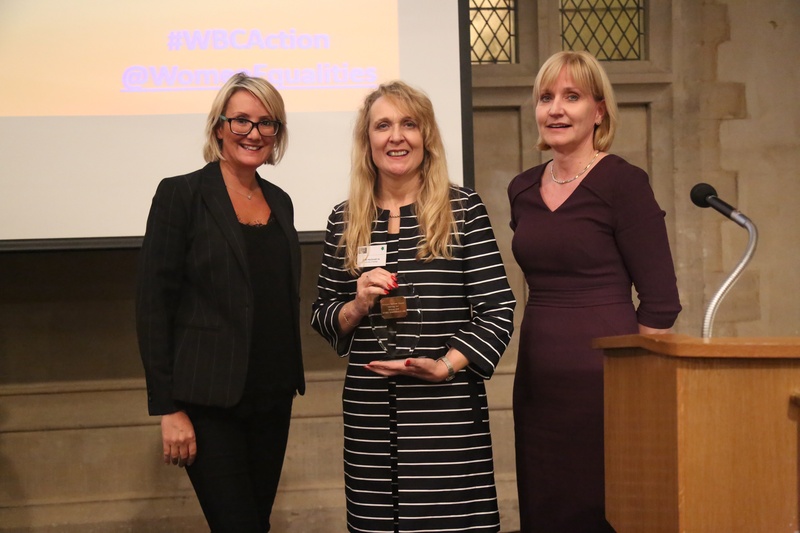 At a reception held at the Guildhall in London held on 17th October 2016, Professor Averil MacDonald OBE, SEPnet’s Diversity and Impact Champion, received the ‘Starting Out Award’ from the Women’s Business Council. The award recognises Prof MacDonald for her work inspiring the next generation to take up careers in STEM including the People Like Me project sponsored by Women in Science and Engineering (WISE). Professor MacDonald has a long standing commitment to encouraging women into careers in Science and Engineering. She has been a role model and has pursued innovative ways of reaching out to girls at an early age to overcome the barriers to gaining STEM qualifications and taking up STEM careers. In 2015 Professor MacDonald was awarded an OBE for her work in promoting Women in Science and Engineering. Proposals can be to support the development of either technical skills (for example, theoretical methods and tools, or practical physics know-how and skills) or more transferable/genetic skills (for example, Managing your Time, or Presenting at Conferences). Although we have provided these examples, we expect that you will have a much better idea from your own experience of exactly what you wished you had known when you had started or what you had difficulty getting to grips with. These modules are designed to help those coming behind you avoid the same problems. You are asked to submit a proposal for an online module, see attached guidelines and form. The proposal should identify the topic, provide an outline of what a module needs to cover and what learning it is intended to deliver. If selected, you will receive mentoring to help you develop a high quality virtual learning package in one of several possible formats (video, website, text etc). This is another skill to add to your portfolio. Collaborative modules between groups of students are particularly welcomed. This is an excellent opportunity to develop your teaching skills and experience for your CV. Before you submit your proposal, there will be a chance to discuss your ideas and see what previous students have done on Tuesday, 25 October 2015 at 11:15-12:15 via Skype. If you wish to participate in this session please email gradnetadmin@sepnet.ac.uk by midday on Friday, 21 October 2016 and I will then send you the SEPnet Skype contact details. Take nine world-class University Physics Departments. Bring together their research, knowledge and resources. The result is SEPnet. Scholarships come with additional research training support from SEPnet of up to £500 per year which may be used for travel to conferences or overseas experiments. Applicants are invited to submit their current C.V. and a short statement of their research interests (max. 200 words) to Cristobel Soares-Smith, SEPnet Graduate Network Administrator, gradnetadmin@sepnet.ac.uk by 15 February 2017. Selected candidates will be invited to attend an Open Day on 22 February 2017 at the Royal Astronomical Society in London in order to meet potential supervisors and learn more about GRADnet. Note that you are also able apply directly to any SEPnet University separately through their standard procedures. If your application is accepted by a particular University after the closing date above, it may not be considered for this GRADnet scholarship award. The SEPnet route should be considered as a distinct path. We will endeavour to make your application available to be considered for all relevant specific awards outside this SEPnet scheme but cannot guarantee that we are aware of all advertised posts from individual supervisors. We expect awards to be made before the end of April. Wednesday, 19 October 2016, University of Hertfordshire, Hertfordshire Sports Village, Hatfield. SEPnet’s Graduate Network (GRADnet) is organising its 6th networking evening to facilitate greater collaboration and links between industry and physics postgraduate research students (PGRs) and researchers. SEPnet PGR students who want to meet businesses and employers from physics-related industries to find out about career opportunities, make contacts and explore research and business ideas. SEPnet partner researchers who want to build links with industry to explore how their research can create impact. Businesses and employers in physics-related industries interested in recruiting physics graduates. Develop your networking and communication skills. Banners If you would like to bring a banner for display let us know and we will reserve you a space. GRADnet is pleased to announce the Induction event for Physics PGRs from across SEPnet. Who: 1st Year Physics PhD students. All SEPnet Departments expect all new students to attend. Where: Park Crescent Conference Centre, 229 Great Portland Street, London, W1W 5PN. Numbers: This event is strongly recommended by all SEPnet partner Departments. Circa 100 students are expected to attend. Students are to sign up for two workshops on arrival and attend one in the morning and one in the afternoon. Register here. Or with your local GRADnet administrator. Deadline to register is 19 October 2016. Please ensure you have your VRE account activated. What: A one day introduction to GRADnet to learn more about opportunities, to meet fellow researchers from across the network and to participate in two from five short workshops designed to get you started in key areas of activity. LaTeX. LaTeX is a document preparation system widely used by physical scientists for the creation of scientific papers, reports and theses, indeed many key journals require paper submission in LaTeX. You will learn to create a simple document covering the key components — title, abstract, sections, tables, equations, figures, and references. MATLAB. Matlab is a high-level technical computing language and interactive environment for algorithm development, data analysis and visualization, and numerical computation. MATLAB can solve technical computing problems faster and more easily than with traditional programming languages, such as C, C++, and FORTRAN. Python. Python is a powerful, high-level scripting language that is widely used in scientific research for a huge range of data analysis and visualisation applications. In this workshop you will learn how to use Python, starting from basic scripts to explore syntax and data types, working up to more complicated ‘real world’ examples. Getting your research published. This workshop will explain the steps necessary to take the results of your research through to a published paper. Led by “insiders” from IOP Publishing, it will explain what makes a good paper and why some authors succeed while others do not. Meetings and conferences. A major part of many students’ PhD is organising meetings; meetings with supervisors, collaborators, sponsors and broader workshops and conferences. This is a practical workshop designed to help you organise conferences, meetings and events from start to finish, without compromising your research. GRADnet is offering a two day course for recent Physics PhD researchers in the SEPnet region. Who: This course is for 1st and 2nd Year Physics PhD researchers. Register here. Registration deadline 25 October 2016. What: An interactive two-day course designed to develop the skills necessary for you to start your PhD research off on the right foot. Throughout the two days you will participate in activities and discussions that help you develop plans and strategies which will enable you to succeed now and that will provide you with a solid foundation for the future after your doctorate. Attendance is required on Day 1 and Day 2. Day 2 is on 29 November 2016 at the OU in Camden and will cover activities with employers. What will this doctorate do for me? Employer panel: What do employers want from physics doctoral graduates?